Like a 32 waist in a fat man store, Misfits Wine Co. doesn't seem to fit in. At the heart of this outfit are 3 unexpected wine souls, all about the produce, not about conforming to the current ideology of the 'wine selling set.' 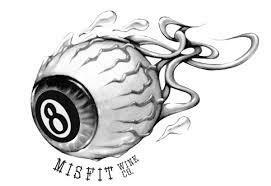 Chris Columbus wanna-be's are in business; Misfits is a part of a whole new winemaking culture ready to be discovered. Misfits Productions rejects convention, doing whatever it takes to make the best product possible. Who are these eccentric Bohemians? None other than Some Young Punks & Adelina's own tattooed boy wonder, Colin McBryde, global wine overlord, Marquis Sauvage and VSI's own fearful leader, Ronnie Sanders. Misfits really doesn't do the term justice to quantify the uniqueness of these three. International Wine Cellar 88 "Opaque ruby. Potent aromas of dark berries, cherry pit and licorice, with a smoky topnote. Lush and expansive, offering spicy blackberry and bitter cherry flavors that are lifted by zesty acidity. Finishes with slightly edgy tannins and good, smoky persistence. "